We understand the patient-doctor relationship, wherein us as doctors are more concerned about the health of the eyes and the majority of our patients are more concerned about looking good in what they wear. So we have been able to offer the best of both worlds and combine these different ways of thinking with what we do. 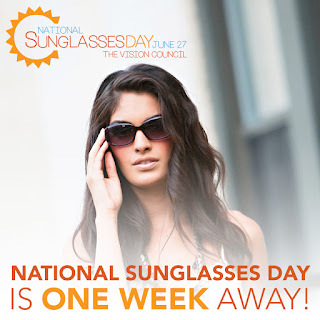 This is one of the main reasons we are putting such a big emphasis on making sure each of our patients knows about June 27th, NATIONAL SUNGLASSES DAY (I really wish we could have you read it with a booming echo instead of thinking we’re just yelling via this blog post in all caps)! 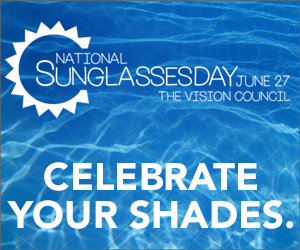 On a more serious note, we are offering 25% off for anyone who comes into the office and purchases sunglasses on 6/27. All of our frames have UV protection and are ensured to protect you from the sun while still making you look good! With brands like Ray-Ban, Tom Ford, Tiffany & Co and Oakley to name a few, you’re sure to find something that you love. We run a promotion every year giving a discount on Ray-Ban frames only and we have to stock up the week before because of the demand we get for them. Imagine how much more a bigger discount on all brands will have! So make sure to come early and see our selection before it runs too low. Exposure to ultraviolet rays emitted from the sun has been linked to several types of skin cancer, but for us and the AOA, we’re most concerned about the eyes. Did you know there’s actually a type of sunburn that your eyes can have? A few of the problems that can occur because of over exposure from UV rays are photokerititis, pterygium, cataracts and even macular degeneration to name a few. 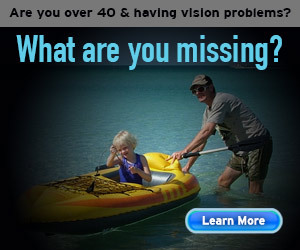 They are very serious and can lead to more severe problems as you age. Luckily we can prevent a lot of those by making sure we have the best type of protection for our vision. I was thinking about going into detail with each disease I just named but thought I would have lost you if I haven’t already. So here is my last ditch effort to get you into the office. Let us style you with the latest sunglasses trends. Give us a call at 909.861.3737 or stop on by the office June 27th to help us support the NATIONAL SUNGLASSES DAY. See you there!